Orbit GT is to launch the new 3DM Feature Extraction product at the Commercial UAV Expo in Las Vegas, NV, USA. “With our new portfolio, we are reaching out to UAV Mapping professionals more than ever before”, says Peter Bonne, CEO of Orbit GT. “As version 18 bundles all the expertise and technology to support the various types of 3D mapping techniques, for sure mapping based on UAV’s has a strong support in our product line. Come and visit us in booth 715 and join us for the presentation on Wed Oct 24th, 1:15-1:30 pm in the exhibit hall theatre.” Orbit 3D Mapping Feature Extraction Basic v18.0 is available for download today. 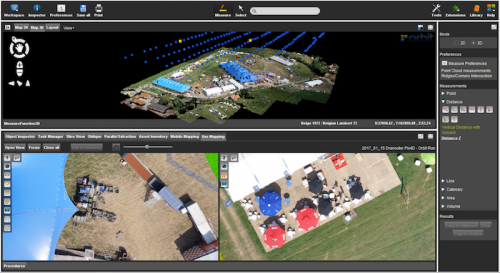 As we experience many of Orbit GT customers are using several techniques of reality capture, such as Mobile Mapping and UAS Mapping, we worked towards an integration of our portfolio to offer a single product line covering the needs for each of these domains. This native integration is a sure win for every customer and user.